Have you ever dreamed of swimming with dolphins? If you’ve ever watched “Dolphin Tale” or “Flipper,” you probably have. To fulfill your dream, here are just some places you can go. Plan a trip and cross this experience off your bucket list. Not surprising considering the many theme parks in this area, you can take the chance to swim with dolphins during a visit to Orlando. There are a couple places to do this. At SeaWorld, attend the Dolphins Up-Close Tour. This is a 45-minute experience where you can interact with Atlantic bottlenose dolphins and learn some training techniques. 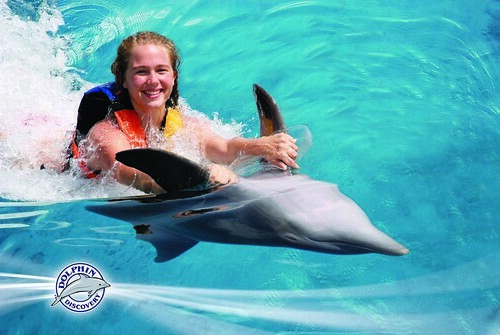 Discovery Cove takes the experience one step further with a one-on-one dolphin experience. This 30-minute adventure includes wading into shallow water and meeting a dolphin with hugs and kisses. Here you’ll get to ride with the dolphin as the mammal pulls you by its dorsal fin to shore. Another excellent option in Florida is the Florida Keys. Islamorada is a great jumping off point for dolphin encounters. At Dolphin Discovery, you get 25 minutes with the dolphins, where you can hug, kiss, and play with them. This also includes the chance to swim into the lagoon along with the dolphins. For a more immersive experience, Trainer for a Day is three hours where you go behind the scenes and get hands-on opportunities to interact with these animals. This includes swimming with the dolphins in the water and a private training session. Other places in the area include Theater of the Sea, Dolphins Plus, and Dolphins Cove, where participants as young as 3 years old can get in the water. Don’t forget to check out deals on Islamorada hotels from HotelPlanner to help you save money on your trip. The Indianapolis Zoo has an extraordinary program that allows you to swim with dolphins. In fact, it’s the only place in the Midwest where you can get in water with these animals. The Dolphin In-Water Adventure is a 90-minute program that includes a classroom session to learn about dolphins, 30 minutes in the water, and a souvenir towel and picture. While in the water, you’ll get to feed a dolphin and have lots of time up close for interactions. With warm oceans waters found right off Hawaii’s shores, it’s not surprising that you can swim with dolphins in Hawaii. Dolphin Quest has locations on both the Big Island of Hawaii as well as Oahu. There are different packages depending on what you’re looking for and the ages of your family members. Experiences last from 20 to 30 minutes in the water plus time learning about the dolphins. Also in Oahu is Sea Life Park, where you can be in the water with dolphins for 45 minutes. This includes a dorsal fin ride and a belly ride! It’s certainly an experience you’ll never forget. As you plan where you want to go to meet a dolphin up close, remember that there are age and height restrictions. Moreover, pregnant women generally aren’t allowed to be a part of the in-water experience. Check out these restrictions before you book your trip to ensure everyone in your party can participate.